Julia Allen, SV High School Class of 2015 Valedictorian, has been named a Merrill Presidential Scholar at Cornell University, where she will soon graduate with a B.S. in Industrial and Labor Relations. This is an honor bestowed upon the top 1% of graduating Cornell students who have demonstrated academic excellence, leadership ability and potential for contributions to society. Julia will be honored at a luncheon for Merrill Scholars May 22. Joining her will be SV High School teacher William Egan. Students who are named Merrill Presidential Scholars at Cornell are asked to recognize a Cornell faculty member AND a teacher from high school who most inspired them. 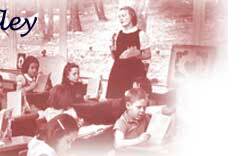 More information on the Merrill Presidential Scholar Program HERE. Susquehanna Valley High School alumni Jason Opela and Phil Gajdorus are among 1,584 SUNY Oneonta students who earned Dean's List honors for the fall 2018 semester. To qualify for the Dean's List, a student must earn a grade-point average of 3.5 or higher while carrying a course load of 12 hours or more. SV grads Nick Miller and Nate Dirig have been named to the Dean's List for the fall 2018 semester at Clarkson University. Elmira College released its Dean's List for Academic Achievement for the Fall 2018 Term. The Dean's List recognizes students that have a grade point average of 3.6 or higher. On that list, a trio of former SV Sabers: Carly Hattala, Mira Hailu and Rachel Feltz. Sabers alumnus Olivia Gorman, a Delaware Valley University student, was selected as a Peer Mentor for the 2018-2019 academic year. Gorman serves as a member of a team of Delaware Valley University upperclassmen selected to mentor first-year students as part of the First-Year Peer Mentor program. Peer Mentors provide first-year students with academic, social, and personal encouragement as they navigate their first year at the University. Under the guidance of the course instructor, each mentor works with a small group of first-year students. Mentors gain valuable leadership experience, and first-year students receive additional support as they navigate their first year on campus. At the end of the fall semester, SUNY New Paltz student and Susquehanna Valley High School grad Liam Axton exhibited original artwork in Tin Type, a collaborative exhibition of photography and metal. Each piece from the metal program was paired with a print from the photography program to form a new relationship in terms of aesthetics, process, or subject matter, creating a new work of art. The exhibit was displayed at the Sojourner Truth Library. Axton also exhibited work as part of the SUNY New Paltz Photography Program American Identities in the AMU Gallery, Prague, Czech Republic, Nov. 6 to Dec. 2. Jason Opela traveled with 92 other SUNY Oneonta students to the Big Apple on October 25 for the college's annual Backpacks to Briefcases alumni networking trip. Students visited 21 well-established alumni at their Manhattan offices and heard about their experiences going from students to top executives. The event is designed to inspire students to jumpstart their careers by beginning to build their professional networks. It is funded by the Oneonta Student Association and the SUNY Oneonta Alumni Association through charitable gifts to the Fund for Oneonta. Opela, a Susquehanna Valley High School graduate, is studying Business Economics at SUNY Oneonta. SV Alumni site up and running! 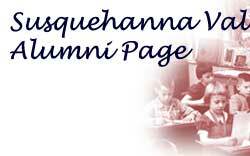 Hey Susquehanna Valley High School alumni: did you know that some of your former fellow alumni have created a new gathering place? While you're still welcome to send alumni news to our district website (email webmaster@svsabers.org), you can also look for news on what SV graduates have been up to, and any reunions that might be in the works HERE. To have your upcoming Reunion information posted, please Mail SV complete and accurate information concerning planned events. Include times, dates, locations, contacts, addresses, phone numbers and costs. As soon as it is provided to us, reunion information will be posted.